In a beige and sterile looking future London, addiction to a new drug is rife. The only people who look happy with this drab existence are those on the ads that pop up in the background of last every scene saying how happy the drugs have made them. As with almost all advertising though, the reality is very different. Grieves is a hardened cop who loathes the drug, and indeed his own addiction and the impact it has had on his family. He is pursuing a lead that the bigwigs behind Ambro, the biggest provider of pharmaceuticals around, might be more than they seem, with the key being a pretty young junkie from off the grid. 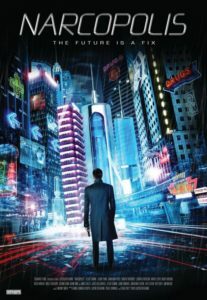 Shades of Blade Runner, Dark City and The Matrix, with a hint of Looper arriving late, only again serve to highlight how much better those other films are by comparison. Narcopolis is an all too apt title, as here is a film that almost effortlessly puts you to sleep.